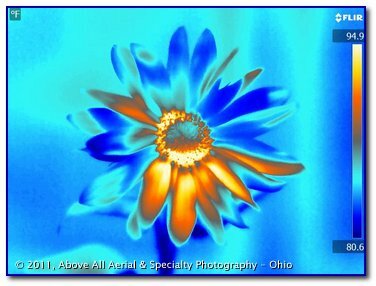 Thermal infrared imaging ("thermography") is another specialty service provided by Above All Aerial & Specialty Photography. 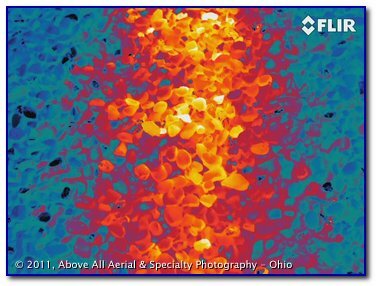 As with our regular photography and video services, we offer both ground-based and airborne infrared services. 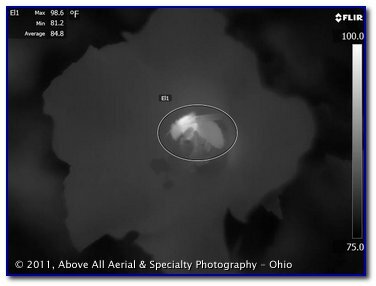 Above All - Ohio is especially and uniquely suited for your aerial infrared image and aerial infrared video acquisition needs. We have been delivering high quality aerial photographs and broadcast-ready HD aerial video successfully for many years. The experience we have and the techniques that we developed doing traditional photography and video give us a definite advantage for aerial infrared applications. 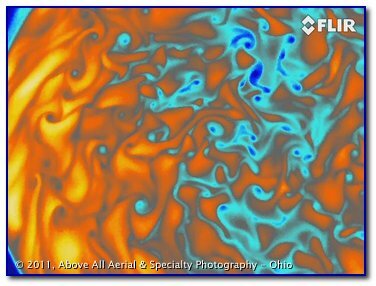 We have perfected proprietary methods for acquiring infrared still imagery and video from the air. Whether you need a survey of a single roof, a pond, an electrical sub-station, or miles of highway or power transmission lines, rest assured that we have what it takes to deliver high quality infrared images and infrared video from the air. Our state-of-the-art equipment allows us to acquire more accurate thermal imagery at a higher resolution than most companies. We utilize the latest and most advanced software to analyze the acquired images. We can provide both aerial and ground-based infrared (and visible) image acquisition. Our on-staff certified infrared thermographer has over 12 years of construction inspection and management experience. We can provide animated and/or interactive presentations - great for boardroom or courtroom presentations! Whether we provide aerial or ground-based services for you, our complete process - from the initial (free!) consultation to image acquisition to final delivery - is done in-house. This allows us to maintain complete control over both the quality of service as well as the quality of the deliverables. We offer our thermography services nationwide. If you need service in multiple locations, you don't need to contact multiple companies and explain your needs over and over. Furthermore, your reports will be consistent from location to location. Our thermography services are covered by our 100% satisfaction guarantee, just like our regular photography services. Please don't hesitate to contact us if you have any questions, if you would like to discuss your specific requirements, if you would like an on-site demonstration, or if you would like a free, no-obligation quote for infrared services (or any of our other services...). Whether your application is roofing, wildlife, electrical, mechanical, construction or building related, research and development related, or even marketing and artistic in nature, we can help! 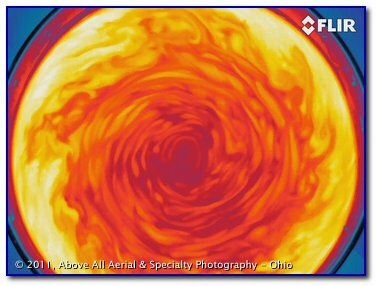 Above All - Ohio's certified infrared thermographer will work with you to ensure that we capture the right images for your application and then get the information you need out of them. Please contact us to discuss your aerial or ground-based infrared applications today!